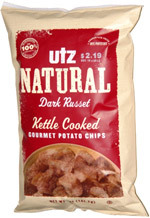 Taste test: These dark russet potato chips were indeed dark and had a great texture, with super crispness, a very nice light crunch, and that dry feeling that russet chips give you without actually drying out your mouth. But when I first bit in, the flavor was on the bland side. After eating a few more of the chips, the flavor did ramp up to a more typical russet chip level of taste, and the taste was quite good. 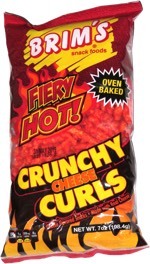 You might have to be a patient chip eater to maximize your enjoyment of these. There were some good-size chips in this bag, but unfortunately some of the smaller chips toward the bottom of the bag looked very oily. Smell test: Very nice russet chips smell.